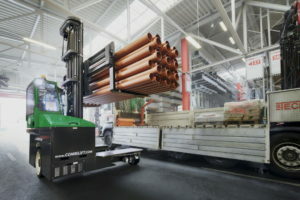 Combilift is the world’s first IC engine-powered all-wheel-drive multidirectional forklift. 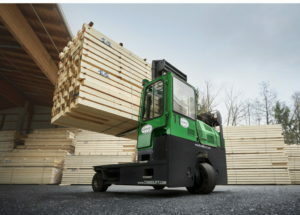 These trucks combine the features of a normal forklift and side-loader in one multi-directional machine making it ideal for confined spaces and particularly for handling larger loads such as timber, steel and plastics. If you have a Combilift machine, or think that a Combilift could be useful for your working application, then we have a few tips on how to best operate it. Naturally, the need to carry out a daily maintenance check is just as key for this truck as any normal forklift. Carry out the usual routine checks before you use it every day to spot any potential issues. It’s vital that you report any issues to your supervisor know as it may need repairing prior to use. If you’ve carried out all of the checks and everything is as it should be, then get comfy! One of the great things about this truck is that it is easy to get comfortable in it for that shift at work. The suspension seat included is very satisfying to sit on and the cab itself is very spacious. Air conditioning and heating are also optional extras which can be fitted to ensure you don’t get too hot or cold whilst working, and can fully focus on the job at hand. The ergonomic controls are very easy to work with too – once you’re fully settled, you should be ready to go. Once you’re ready to go, then it’s time to turn the ignition and take the truck for a spin. We recommend doing this without a load at first just to get used to how it handles. One of the unique features of the Combilift is the multi-directional movement it offers to the user. You are able to operate in forward mode, sideways mode or carousel mode, depending on the task. All these modes effectively give complete 4-way steering, so take time to get used to this. The forks are designed in a way that they can reach in and out for longer loads with the relevant controls inside the cab. Take time to slowly get used to using these controls, ready for when needed on the job. Obviously, they also go up and down too but this works as in a standard truck. The Combilift also contains emergency controls in the cab for full safety, so familiarise yourselves with these in case you ever need them. Once you’re happy with both the maintenance of the vehicle and how to operate it with the cab controls, you can start using it to work. As this combines a side loader with a normal truck, it is vital to pay attention to the job you are using it for. Always remember to load the forks up safely and never overload the truck. The cab gives superb visibility so make sure to use this to your advantage. As with a normal truck, remember to be careful when lining the forks up with the load to avoid any product damage. The controls on the Combilift are very smooth, so keep it slow and steady when in use, particularly with longer loads. If your Combilift has the optional hydraulic fork positioners or telescopic fork controls in the cab, then use these to make your life even easier. Come the end of your shift, it’s as simple as returning the Combilift to its parking area and switching off for the time being. 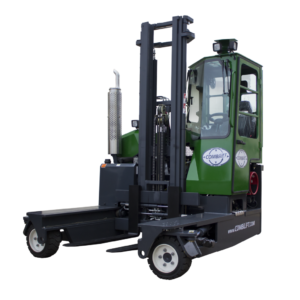 You will probably find you have achieved more than a standard forklift or a sideloader! If you like the sound of what the innovative Combilift truck has to offer then let us help find you one. With great prices and superb choice, we are a name you can trust.